My 8th graders look at me blankly. “You know The Venetian, on the Strip?” I ask. “Awww,” murmurs my class in a collective hum of understanding. I sigh, disgusted with myself. Venice is a glorious city with thousands of years of history, famous art museums, a decadent and sordid past, and the glittering St. Mark’s Basilica. To compare the sinking city with its casino counterpart is probably not the recommended way to teach 8th grade World Geography. On the other hand, you gotta start where your students are. And my students are in Vegas. And Vegas apparently wants to be in Italy. The Venetian is one of THREE Italian themed Vegas hotels, not to mention the whole wanna-be Italian village northeast of the city. 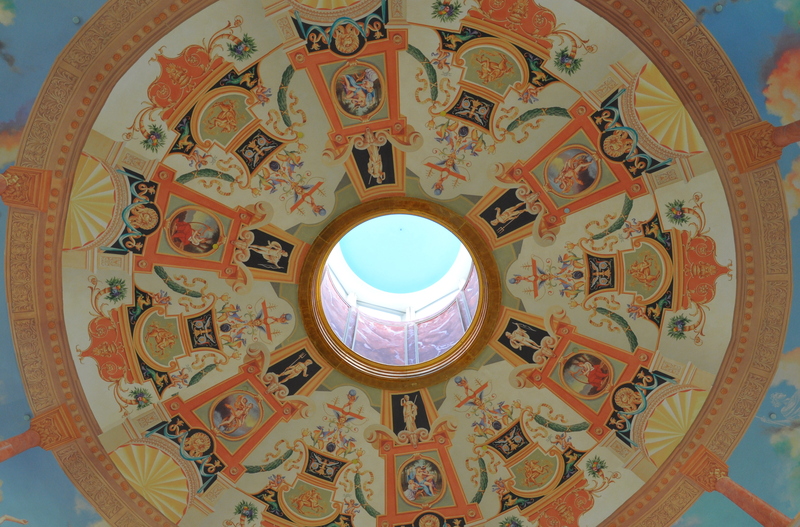 The Venetian: This gorgeous hotel and its twin The Palazzo does sort of look like Venice. Besides the striped-shirt wearing gondoliers, this hotel has a Venetian plaza façade, a replica of St. Mark’s Campanile, and a fake Grand Rialto. The casino canals are just a tad cleaner than I remember the actual Venetian canals being. 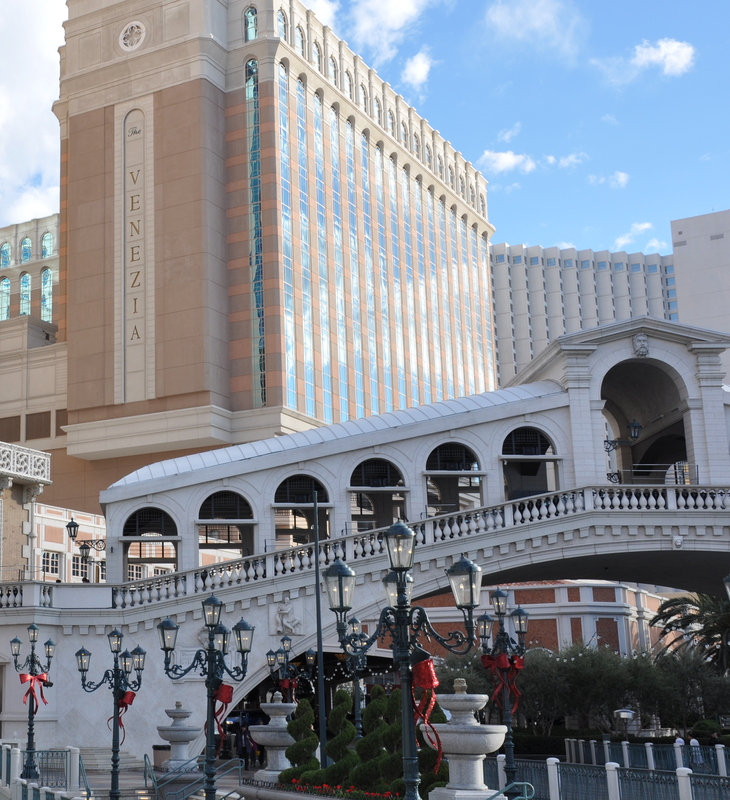 This winter The Venetian has pulled out all the stops, making it THE place to experience fake winter in Las Vegas. Chefs are selling hot roasted chestnuts, there is an ice skating rink over the canal outside, and the biggest white tree on the Strip stands next to that tower. No Christmas markets or rows of food stalls though, which was my favorite part of Venice – real Venice. 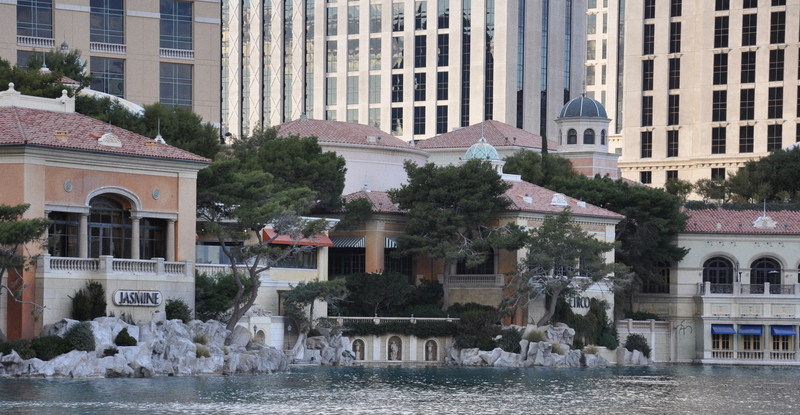 The Bellagio: Inspired by Italy’s Lake Como, the Bellagio is (in my opinion) the most elegant hotel on the Strip. Unlike Venice, I’ve never been to Lake Como, so I can’t really compare the two, but I’m guessing that Lake Como does not feature dancing fountains like The Bellagio does. Watching the fountain shows are my favorite Las Vegas activity, and a must for any tourist. Hopefully you’ll see “Time to Say Goodbye,” sung by Andrea Bocelli and Sarah Brightman. It is the hotel’s theme song. The fountains dance daily from 3pm – 7pm every half hour, and run every fifteen minutes from 7pm until midnight. On Saturdays the shows start at noon, and the fountains start dancing on Sundays at 11am. Inside the hotel, make sure you check out the world tallest chocolate fountain and the Conservatory and Botanical Gardens, which change seasonally. 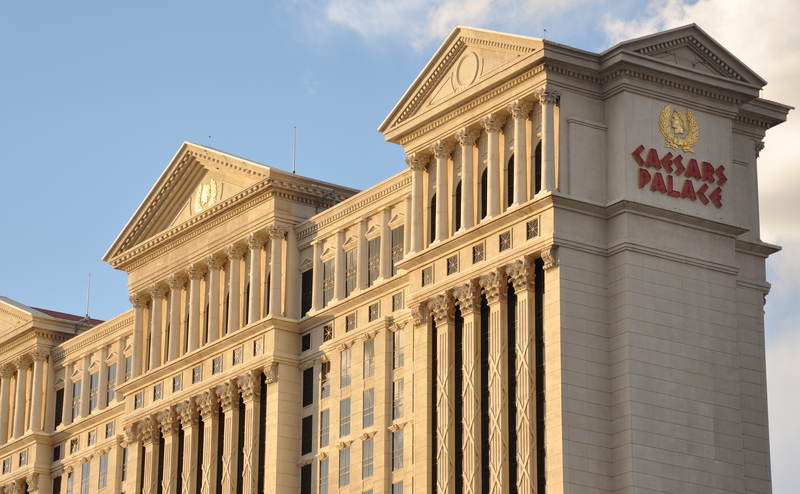 Caesar’s Palace: This place keeps getting bigger and bigger, taking up a ginormous Las Vegas block. Caesar’s is the home of Celine Dion’s famous show (which is coming back to Las Vegas, by the way), a huge mall (the forum shops), and the nightclub PURE (which I can’t say much about because my PURE memories are very sketchy for some reason. I remember a lot of white couches I wasn’t allowed to sit on). Romanesque statues are ALL OVER Caesars. Much like counting the fountains of Kansas City, to get an actual statue count would take some serious mapping skills. 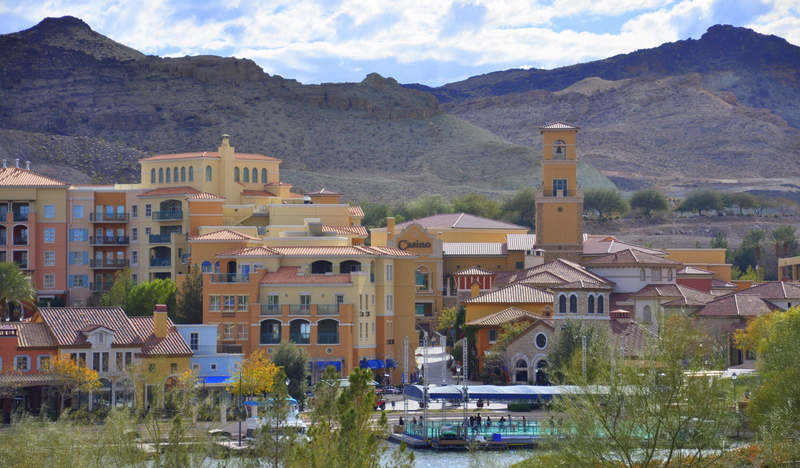 Lake Las Vegas: Famous for housing Celine Dion, this fake little Italian village is about 30 minutes outsides of Vegas. Take Highway 215 east until it becomes E Lake Mead Drive. Turn left at the big sign announcing you’ve arrived at Lake Las Vegas. The super swanky mansions plus the ongoing housing bust equals a depressingly quiet and empty Lake Las Vegas. The community here tries hard to keep things afloat with outside movie nights and concert in the summer and ice skating and caroling in the winter. There are a few restaurants and shops open along Strada Di Villaggio, and Monte Lago is a nice casino to gamble at if you want to get away from the screaming hordes of the Las Vegas Strip (but who really wants to get away from that? Have a few tequila shots and join in!) With its cluster of shops on the lake and hills rising from behind, the village does look a tad Italian. I would not exactly plan any class field trips to have my students study Italian culture based on these places. Likewise, if you are in the mood for gondoliers, gelato, and statues glorifying the Roman physique, I recommend that you go to Italy. But if you need a quick classroom connection, or can’t afford a ticket to Rome, I guess Las Vegas will do.